It was a megaproject half a century in the making — possibly the largest construction operation, and certainly the largest relocation project, in Canadian history, and a technological and engineering marvel that stands as one of the most ambitious borderlands undertakings ever embarked upon by two countries. The planning and building of the St. Lawrence Seaway and Power Project is one of the defining episodes in North American history. The project began with transnational negotiations that spanned two world wars and the formative years of the Cold War and included a failed attempt to construct an all-Canadian seaway, which was scuttled by US national security fears. Once an agreement was reached, the massive engineering and construction operation began, as did the large-scale rehabilitation scheme to move people and infrastructure away from the thousands of acres of land that would soon be flooded. 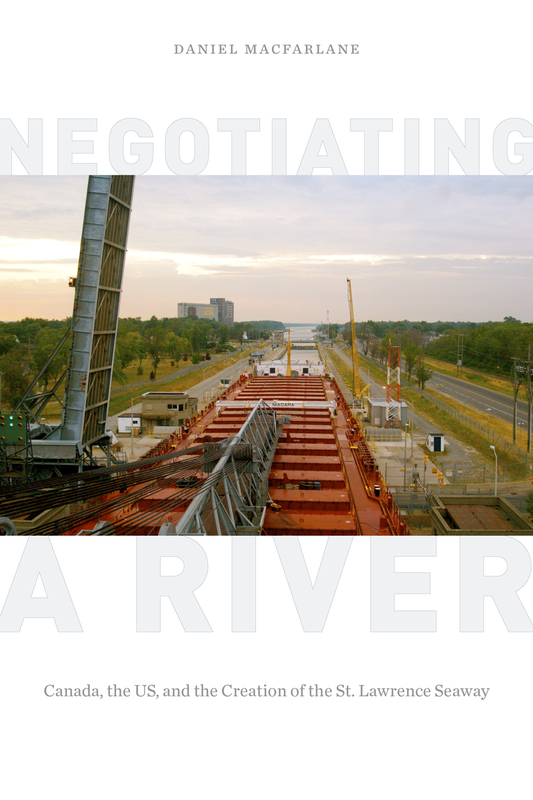 While the story of the St. Lawrence Seaway and Power Project is too often relegated to a footnote in Canadian history, Negotiating a River looks at the profound impacts of this megaproject, from the complex diplomatic negotiations, political manoeuvring, and environmental diplomacy to the implications on national identities and transnational relations.